^While "health and wealth" proponents urge Christians to claim for themselves material blessings, others insist that God's best gifts can't be enjoyed until heaven. The truth of God's intentions, writes acclaimed author Jonathan Wilson-Hartgrove, is far greater than either perspective suggests. ^ ^Packed with inspiring stories, God's Economy invites readers to step into the good life God intends his people to enjoy here and now - not a shrink-wrapped, plastic version of prosperity but a liberating approach to living that leads to genuine and lasting satisfaction. 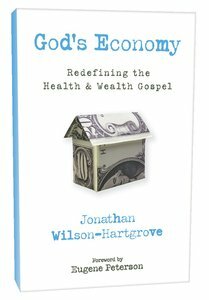 ^ ^With persuasive enthusiasm, Jonathan Wilson-Hartgrove draws from the teachings of Jesus on money and explores five tactics for living in God's economy of abundance. Rather than being subject to unpredictable market factors, those who live by God's economy find their security in the richness of community and generosity. Are you dissatisfied with the gospel of health and wealth? Health and wealth proponents urge Christians to claim material blessings on earth. Others insist that God's best gifts can't be enjoyed until heaven. The truth of God's intentions, writes acclaimed author Jonathan Wilson-Hartgrove, is far greater than either perspective suggests. Packed with inspiring stories, God's Economy invites you to step into the good life God intends you to enjoy here and now---not a shrink-wrapped, plastic version of prosperity but a liberating approach to living that leads to genuine and lasting satisfaction. With persuasive enthusiasm, Jonathan Wilson-Hartgrove draws from Jesus' teachings on money, exploring five tactics for living in God's economy of abundance. Then, he demonstrates how people have practiced these tactics in the past, as well as what these principles can do for you, your family, and your church today. From your human relationships to your spiritual life, this practical guide cuts through the clutter and invites you to discover what can happen when you invest in God's Economy. Jonathan Wilson-Hartgrove (M.Div., Duke Divinity School) is director of the School for Conversion in Durham, North Carolina, where he is a member of the Rutba House new monastic community. He is the author of To Baghdad and Beyond, Free to be Bound, New Monasticism: What It Has to Say to Today's Church, Becoming the Answer to Our Prayers, and most recently God's Economy:Redefining the Health and Wealth Gospel, and the co-author of Inhabiting the Church: Biblical Wisdom for a New Monasticism. He is also the coeditor of School(s) for Conversion: 12 Marks of a New Monasticism. Catch up with him at newmonasticism.org.